It didn’t take long after Muammar Qaddafi met his end last week for ill-conceived boasts to emerge. And of course, they issued from deep within the biggest spin zone of our current day: the Obama White House. 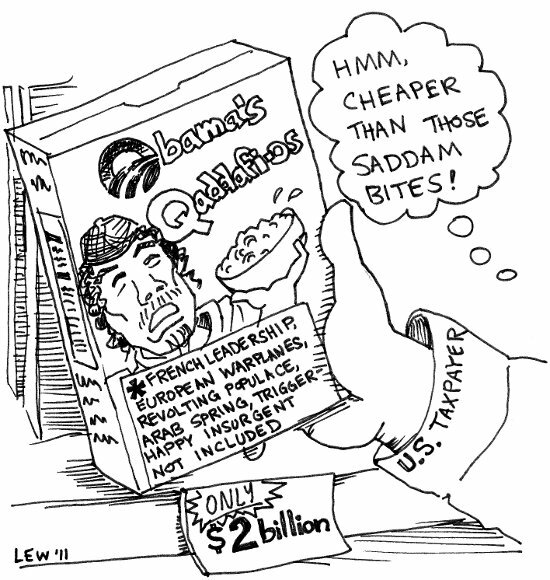 Vice President Biden touted that it cost the U.S. only $2 billion to bag Qaddafi. Not that we were after his head in the first place, right? Such wrangling from Biden is reminiscent of the false economic paradigm everyone seems to be caught in: giving presidents too much credit for the state of the economy. When it comes down to it, a president and even the government only have so much influence over economic performance. The same is true for foreign affairs. The current administration merely sent a token greeting card to the Libyan revolutionaries, and now that good weather comes their way, they take as much credit as they can grab. But you couldn’t blame them given the current approval ratings.